Entry by mr.zephyr on Wed Dec 15 08:50:25 2010. And Korea claims breasts once again! iff u look alllllllllllllllllllllllllll the way to the back; france is running nakid and swiss will now shoot him. hahhaa.. hong kong karate chops korea! Spaniards get rediculously dark in the sun. Das wai he so black. Poor Matthew. Anyways, is that Taiwan, the one getting groped by Korea? (o.o)? where's Japan? Seriously, I can't find him!! @Botan18 I think Japan is between Greece and Turkey in the back just above Hungray and Austria. I found Canada too! OMG he's invisible! Spain is so seme with the Italy brothers.I barely spotted Canada.Poor thing. gaahhhh! poland! xD spain! I LOVE YOU IF I THINK WHAT YOU'RE GONNA DO IS TRUE! i finally found mattew! !it was hard to find him!! gilbird is ready to swim with gilbert!! LOL. Germany's treating Prussia like a dog! 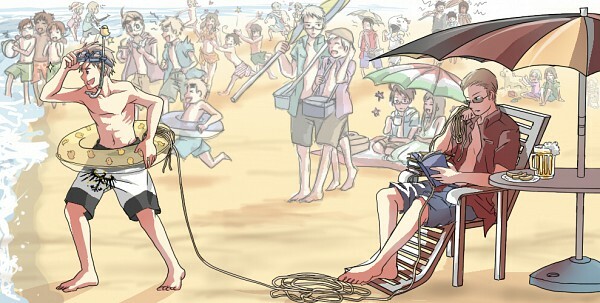 Is Prussia so reckless that he needs a rope to hold on to him? Or is it just a safety precaution by Germany? This is like find waldo...only with Canada. No one commented on Poland building a sand pony?! at least Germany takes care of Prussia. It's out of love and worry. Poor russia he's bein stocked by belarus again oh my god Canada IS there!!!! also i heard of tanning but i don't think that spain is BLACK!!! WTF people really. LOL, this image is great! The awesomeness of the twinkle in Gil's eyes, and the rope.... This is where the big brother role seems to become.... Reversed? But ya, awesome! Thank you kuu, mr. zephyr! And, Prussia... Y U SO AWESOME! XD XD XD LOL! Maybe Prussia doesn't have the leash because he is a leash child. Maybe Germany uses it to pull him in for more sunscreen so he does not burn. Also I found Canada.